Bible Numbers: 1260 days, 1290 days, 1335 days, 1260 years. The following is an email sent to me. My response follows it. In my recent study of Daniel, I have been stumped by the last two numbers given in the book of Daniel, 1290 and 1335. Google yielded a link to one of your sites and the information there was quite interesting. You have laid out different dates that are 1290 and 1335 years apart. I have a couple questions about those dates. 1. In Daniel 12 it says in verses 8 and 9, "I heard but did not understand. So I asked, "My lord, what will be the outcome of these things?" He said, "Go on your way, Daniel, for the words are secret and sealed until the time of the end." (HCSB). This indicates that Daniel should go on his way, inferring that he shouldn't worry about it, because the words are secret and sealed until the time of the end. If that is true, then how do your dates work since didn't Daniel live to see the fall of Babylon? Daniel didn't live in the time of the end. Who gives a rip in the time of the end that Babylon fell 2500 years ago? 2. In Daniel 12:11-12 it says, "From the time the daily sacrifice is abolished and the abomination of desolation is set up, there will be 1,290 days. Blessed is the one who waits for and reaches 1,335 days." Do your dates start 'from the time the daily sacrifice is abolished'? 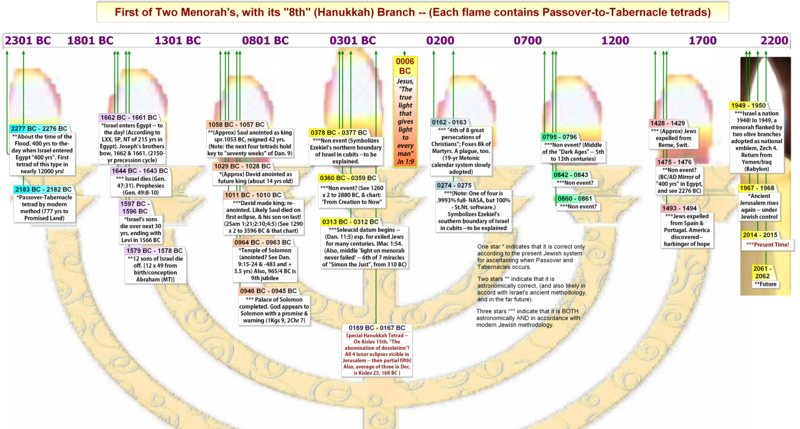 What is the 'abomination of desolation' and was it setup at the beginning if your dates? Thank you kindly for your time and all that you do to put the word of God on the internet. If you have time to address my searching questions, I will be most ecstatic. In prophecy, past events usually type out and foreshadow future events. This is a well documented concept within bible prophecy as any good commentary on the bible will tell you. The prophecy about the fall of Babylon, for example, is found in two chapters of the book of Revelation --- long after literal Babylon fell. As a matter of fact, the prophecy about Babylon in the book of Revelation is a composite of verses alluded to in the Old Testament. Thus the prophet John links future events to all that preceded that event thereby impregnating every thought about Babylon in the book of Revelation with meaning when that link to the original founding prophecy is examined. And this is also equally true of biblical time frames, such as 1290 and 1335. The grand point of my work in the numbers is not that these numeric time frames have been completely fulfilled already, but rather that what has been before is tied directly to what is yet to come, both numerically and thematically. Thus, when all things eventually culminate in a literal 1260 + 1290 day (etc.) period of tribulation it will be intricately tied to similar past events both by theme and by numeric, such as, say, 1260 + 1335 years to 1260 + 1335 days. And there are many such examples of this very thing that have already been fulfilled in ancient times with even more precision, as is examined in the bible-numbers web site. The wisdom of God is to show forth His divine sovereignty in human affairs, and to give certain comfort to the afflicted who have or will go through such afflictions. In the bible, God does everything using at least two or three witnesses to them. To have a numeric that binds days and years together as just suggested produces such a double witness. And this, together with thematic parallels, indeed grants comfort to the afflicted and warning to the wicked in such perilous times, especially that final seven years of tribulation yet to come as foretold throughout the bible. The fact that God has now revealed the workings of bible numbers (as per the prophecy of Dan. 12:8-9 as quoted in your letter) moreover proves that we are very near His Second Coming and of the End of the Age. "Purpose and Scope" (along with that entire series).